The Pirelli Scorpion Trail II Tires were specifically designed to meet the versatility of the modern adventure touring motorcycle. They feature an aggressive tread pattern supported by strong technological innovations, giving good stability even at high speed, excellent traction on dirt as well as superior handling, comfort and grip in all riding conditions. The tread pattern of Pirelli Scorpion Trail II Tires have an aggressive look typical of an off-road tire, but that combines the greatest features of an enduro tire with those of a sport touring tire. The side grooves have been designed to ensure optimal drainage of water, while the layout and shape of the central grooves not only contribute to the drainage of water but also ensure better traction, greater stability and normal wear. The entire Pirelli Scorpion Trail II tire line features a dual compound construction. Compared to its predecessor, this tire has a wider central section which contains a compound developed for high mileage without compromising cornering performance. The side compound was designed to optimize the balance between performance on dry and wet roads. Thanks to a shorter, wider, contact patch area, the profile helps to reduce and level the wear of the tire while maintaining consistent performance throughout its life. The structure that lies beneath the Pirelli Scorpion Trail 2 Tires ensures high performance, even at full load or with heavier motorcycles, making it comfortable for long trips and winding roads. Quality - the grip on this tires is great. So I have the option of going on light fire roads, but also to handle tarmac with gravel, which can catch you off guard. I still wanted to maintain what a sport touring tire offers - grip, cornering confidence and longevity. I run mostly highway. These appeared to have good grip as well as road worthiness. I trust pirelli tires and their quality. Earlier version came on the bike and worked well. Also very good reviews for its wet weather performance. This is my second Pirelli Scorpion Trail II installed on a 2006 Buell Ulysses. The first one lasted 12,000 miles. I'm sold! I have read how well it works on the big adventure bikes. I have a KTM 1290 super adventure and want to upgrade from the original OEM tires. I currently have the Scorpion Trail tire, and I like them. These are the new version of a tire I already approve of! Thank you, and have a great day. Needed new tires for my Suzuki V-strom, mostly ridden on the street. Replacing OEM Pirelli Scorpion Trail. I know Pirelli makes great tires and the Dunlop's that came on my Adventure Bike didn't last very long. I'm hoping these will give me more tread life. So basically I'm trying a different brand to see how these work out. Better grip than the scorpion trail 1. Good reputation and a fair price. Have run Pirelli Scorpion Trail in the past. I wanted a quieter, less aggressive tire, and I mostly do street driving. They also are rated very high by previous users. 2,500 miles so far and they are great! Wanted a road tire with a bit more grip in the event of gravel, such as in road work. Positive reviews. Dual compound, mostly street. Excellent grip. Several track days on these tires and they work great with my F700GS. I have the same one on the back and it's performed great, so I'm back to replace the front. Much improved from the earlier version of this tire. Hear these were excellent for sport touring and extending into light offroad! I have a dual sport bike for commuting and weekend rides. This is one of the 2 tires the experts at Revzilla recommended for my bike and style of riding. Have had great success in the past with these tires. Best tires ever. Soooo stabile on wet and dry pavement- I don't even feel tar snake on wet! Haven't use them on trail but most of my riding is commute 35miles each way. Ahhhhh, the new tire feel. I got just over 10,000 miles on the first set of the originals and love them. These should be at least as good pr better. I trust this brand a lot and the price/quality is great. because my current tires are worn. Love the Scorpion Trail, but wanted Dual Compound. When I saw Pirelli had figured that out, I had to give the new version a try. Brilliant! These tires are the update to my CB500X's factory tires, which have worked well for the last 2 years, 8500 miles. I don't think I'd quite reached the end of my old tire's life, until I locked up the rear on the highway last week. After that I took a good hard look and decided not to wait any longer. Hoping for another great couple of years out of this new set. Is this tire a 95/5 just like the original Trail 1's? BEST ANSWER: it's a 90-10 tire that can do a good job on hard gravel. Avoid mud and sand. What kind of mileage total should I expect out of the life of these tires? BEST ANSWER: I ride a CB500X. Current mileage is 11500+\- . OEM Scorpion Trail was down to 10% by 7K miles then I burn down to bald spinning my way through some sand out in the Mojave. So I replaced it with Trail II With a little better then 4K miles on it, the Scorpion Trail II is looking pretty fresh. With a keen eye you can distinguish between the center contact patch compound and the softer side tread. To sum up, I can't answer your specific question. However for what it's worth it is my opinion that the Trail II is a substantive upgrade over the first generation S/T. I have every intention of sticking with this tire for future replacement. For clarity, I am still running the OEM Trail I on the front and it likely won't get me beyond 13k. My Scorpion IIs are now at 4500 miles which I hope to be the halfway point. I don't have a tread gauge, but just eye-balling it I'm concerned that the rear won't make 9000 miles. The middle section is now a flat ribbon. The total tread depth compared to the depth to the wear bar is roughly equivalent now. I'm fine with replacing again at 7500 if needed. The grip, wet and dry, has been excellent. I've been running at 33 and 33 psig. I just bumped up to 34 and 35 psig front and rear. I'm still very happy with these. Hope that helps. It all depends on how you ride. These tires have excellent grip on dry, wet and they are so-so on the dirt. I ride them on my Multistrada. With 160 hp on tap, I get 5k on the rear and 7k on the front. I'm heavy on the throttle. The tread is deep so there's potential for a lot of miles. Haven't had the Trail II tires on very long yet, but expect as good or better than the Trail tires I had. Got 8,500 rear and 12,000 front with those. Can these tires be used with tubes safely? BEST ANSWER: I have no experience using tubes in a tubeless tire. I will say that I have close to 7K miles on this rear tire. Appearance of the tread causes me to presume I could easily get twice that mileage out of this tire. Tire is mounted to a CB500X. I have only ever used them tubeless. I would suggest you refer to the RMA manufacturers tire guide to check your application. I've had them on my thruxton for near a year now. Put them through a 2500 mi trip no problems. I'm purchasing a Daytona 675R that comes stock with the supercorsa's. Since they are strictly dry only tires, I want to have them changed out immediately to something that can handle both wet and dry commuting... As well as provide some grip when encountering the occasional gravel scattered across the roads here in Texas. I had a few slips in corners on gravel patches around the city which lead to a low side once a while back. 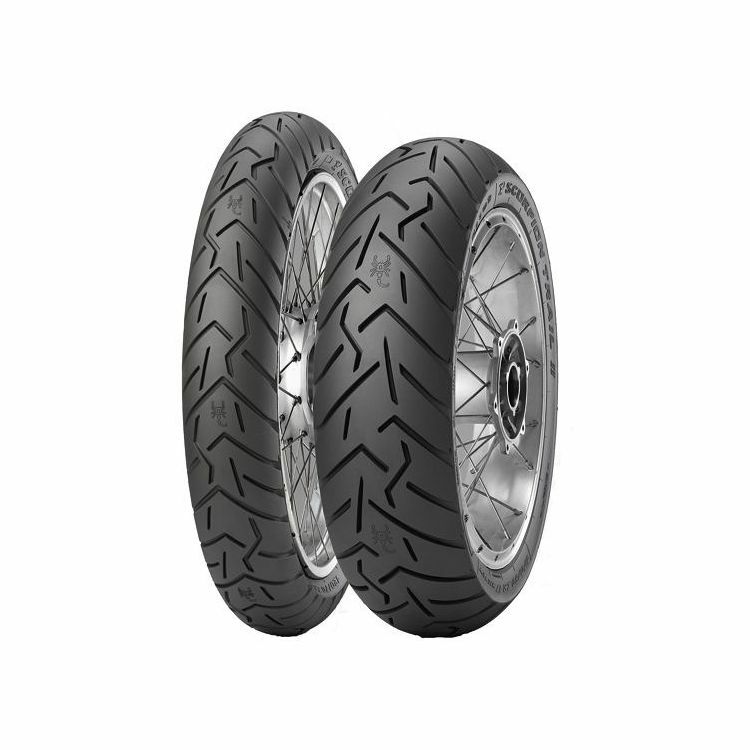 So between these and the Angel GT's, which would be a better tire while still providing some level of that confidence enspiring grip the supercorsa's offer on dry conditions - but in a more "universal" condition? These will NOT be used on track - strictly commuting, cruising and sight seeing. BEST ANSWER: My new Scorpion Trail IIs are the OEM upgrade for my Honda CB500X. I commute 50 miles daily in all conditions, so wet / cool and hot / dry surfaces are normal fare. Lean angles ~ 40 degrees; not super aggressive but serious enough for me. I'm backing off the speed a little on wet days, but not much. The Scorp IIs are stuck like glue throughout my cornering with no difference in wet vs dry performance. The IIs have not hydroplaned either. The IIs are significantly improved from the original Scorp Trails. One difference is the rear profile; I no longer need to counter steer as much with the new IIs and the rubber compound is stickier all around. Gravel is another story, but I don't think any tire can solve that problem. Quick surface evaluation is a must at intersections and unfamiliar roads. I got 7500 miles on the originals and hoping to make 9000 miles on the IIs. I thought about Michelin PR3s or 4s, but I have no reason to change from these now. I'm completely satisfied with the Scorp IIs so far. I can't provide much help here. I ride a CB500X. First bike for me. I put 7500 miles on a Scorpion Trail (I) then replaced it with a S/T II. I have about 3000 on it and it still looks new with a subtle flat patch down the centerline. I can't speak to any other tire, but the Pirellis have been good to ride on. Last trip was 2200 miles with only a little desert dirt and forest dirt when scouting a campsite. Gravel patches are what they are but dispite a little sideslip here and there I've never experienced an fall or a pucker moment. I honestly don't know much about the Angel GT's but I've been running the Scorpion II on my Multistrada for 11,000 miles in Vermont. We have gravel, rain and dirt roads all of which these tires Gobble up pretty nicely. I rode them on the track once at street pressure and they worked well. I ride hard on the country roads with confidence. Haven't gotten a lot of miles on them thus far but like them so far. Had the original Trails on before these and liked them, and see no reason to dislke these. Great in wet or dry conditions. Any tire will be dicey where there's gravel on road in my opinion. Im in the market for new tires for my 2013 S10, I am looking for a set of tires that are great for mainly road, I will be commuting on highway and with 17 miles of curves, riding in wet and dry conditions, I am looking hard at the Battlax A40 right now, how would these compare? BEST ANSWER: I ride the scorpion trail II on my 2015 multistrada. So far I have 5000 miles on it. The fronts are still in great shape, the rear needs replacing soon. I ride pretty hard including 2 track days so far. Got caught in 3 heavy downpours one day, cars were pulling off the road but I kept going with no issues. So far I love these tires. Haven't really tried them much in the dirt or dirt roads yet. I can't compare to the Battlax since I've never ridden them except in 2007-08 on my FJR. I think they're worth the money. I think you are confused Wayne , a S10 in the motorcycle world is short for super tenere it's not a pick up! Thank you tho . Is this tire tubeless or for spoked tube wheels only? I am looking to replace my Scorpion Trail 1 tires on my '14 tiger 800ABS. Wanting something a little stickier. nope, they are not for tube tires only, you can fit them on your 800 as well. I'm riding a ducati scrambler and it is a light bike how will these tire work when it was built for a heavier bike ? BEST ANSWER: They work very well on a Ducati Multistrada. Very pleased with the performance and feedback but they did not last very long (3500 miles). Depending on your use you might also want to consider the Metzeler Roadtec 01 (on my 2nd set now) or Pirelli Angel GTs. These will give similar (if not better) performance and last a lot longer. I run these on my Honda CB500X which is pretty light at ~430lbs. This bike was factory spec'd with the first version of these tires, FWIW. No problems. what is the proper tire pressure for the Scorpion Trail 2, 180/55/ZR 17? BEST ANSWER: Tire pressure shroud be what is recommended on the tire (32/36). For trail riding, a few PSI lower is ideal for improved traction. On some forums, riders reported using 22psi. But I think that’s asking for trouble since these are not true off-road tires and only mount like a street tire. I inflate mine at 37 front, 42 rear. So far I’ve clocked 8k on both tires. Can anyone comment on the profile of these tires? Sharper turn in and pointy? More predictable and rounder? BEST ANSWER: PRedictable, round and still has a nice turn/fall in. Shocked and happy, although I did go once size down the recommended and happier I did. Flatter and rounder but still offers good turn-in. I'm looking at the Scorpion Trail II for my Bandit 1250. Not a typical adventure bike, weighs in at 560 with a 450 lb carrying capacity. I'm wondering if these tires will hold up with that weight? I'm looking for better feel on gravel roads than a typical sport touring tire. Thanks! BEST ANSWER: I do not think you will have problem using the PS ll tires on your Bandit. As I understand it, the PS lls are essentially the same tire as the Pirelli Angel GT, which is a long wearing and sticky sport touring tire. I had the Angels on a BMW K1600 which weighs 700+ pounds and got almost 10k miles out of the rear tire! I cant wait for my stock tires to wear out so I can put on the PS ll tires! Get them, they are specifically built for big bikes. I have a triumph explorer that weighs 600 + pounds and i love them. The compound is not quite the same as the angel GT, it's a bit softer, but you should get a good 7k out of them.